You only get one 21st birthday, so it should be something to remember. My 21st birthday was not all that exciting, in fact, we were flying home from Las Vegas. Woo. So when it was time for my younger sister's coveted 21st, I was going to make sure that she would have a blast. Working with her best friends, I helped plan an extravaganza that involved dressing up, dining out, and coming back in to party the night away. 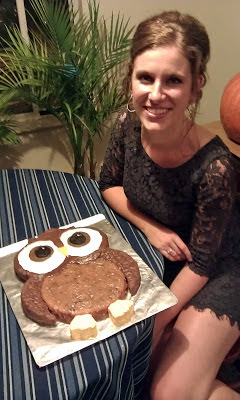 I decided to outdo myself by making an owl cake that I had found on Pinterest. I went back and forth about making it gluten-free, and decided to do so in order to be able to share it with all of you. I used two boxes of King Arthur's Gluten-Free Yellow Cake Mix and several Betty Crocker frostings. The eyes I left in the hands of Steven and our good friend, Matt. They found a marshmallow fondant recipe online and decided to make their own from scratch. It was the stickiest mess I have ever seen, but amazingly, it turned out fabulous. Making this cake was a lot of fun. We managed to keep the cake a surprise to Melanie, and when she finally got to see it, she was very excited. Throughout the night I received so many compliments on how great it turned out, and once everyone found out it was gluten-free, they were even more shocked at how great it tasted. Overall, Melanie's birthday was a huge success, and I'm certain everyone had a fabulous time.